If you are here from Leslie’s blog, My Hundred Year Old Home, then welcome. Leslie has a fantastic eye for farmhouse decor and her home is just stunning. Thanks for stopping in today because you are in for a treat. Not only are there so many great DIY’s to see, but who doesn’t want the chance to win money! At the end of this post you will find a link to enter to win. 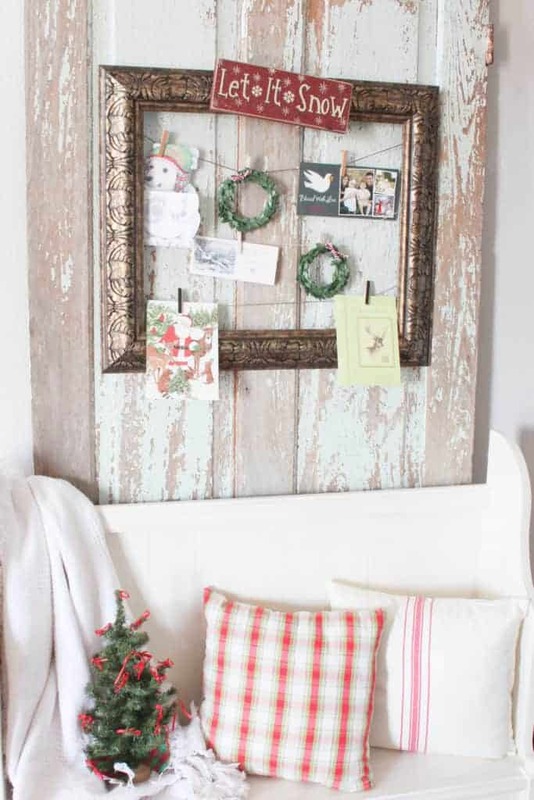 How do you display your Christmas Holiday cards? If you’re like me you paste them to the fridge until there isn’t enough room on the fridge anymore, so they end up in a drawer somewhere. Can I be honest? I’m not really a fan of hanging anything on my fridge, but every year I do somehow decide to paste Christmas cards all over it. Why can’t I figure out a better way to display friends and family? This year I decided it was time to make my own Christmas Holiday card holder with a frame. I love Christmas decor and the feeling it gives you when your house is all decked out for the holidays. 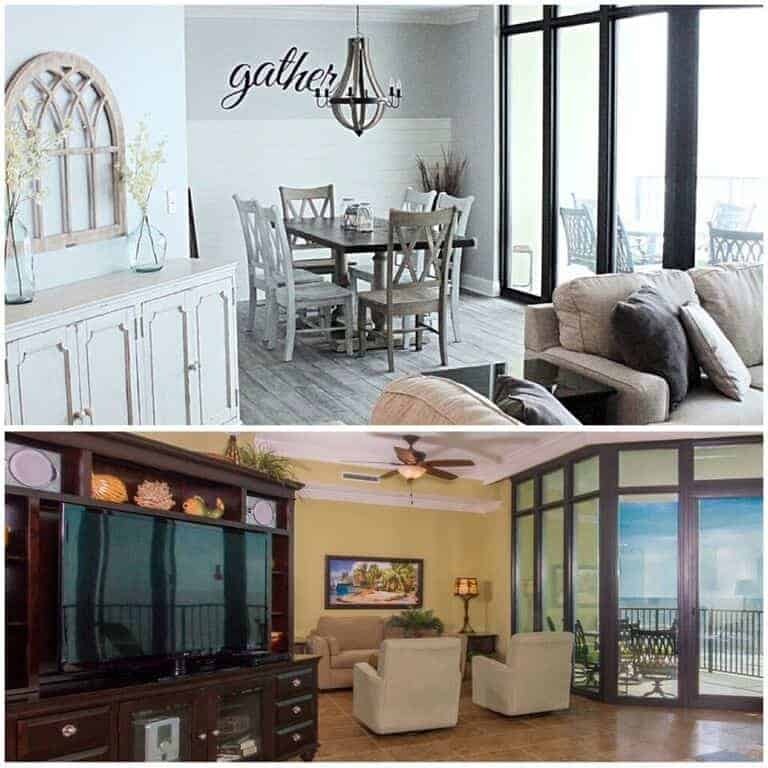 I don’t love when my house feels “cluttered” with stuff, and that’s how I felt in my kitchen when I had Christmas cards all over the fridge and countertops. I decided this year would be different and I would find a way to display the holiday cards in a creative and pretty manner like a frame. This is a very simple project that probably doesn’t require you to purchase anything (most of you will have all the items on hand). 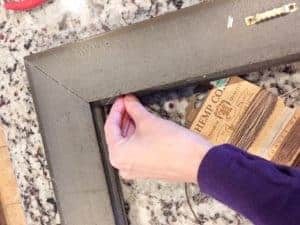 hot glue gun – I recommend hot glue because it’s easy to peel off when you’re done with the holiday card frame. 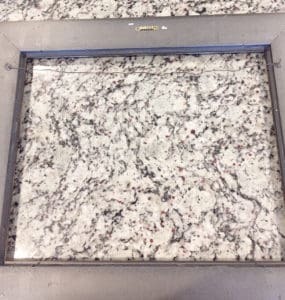 any decorative items that you want to use to “embellish” the frame with. Let me share a quick video I created of the process. Like I said earlier, this project is easy peasy. First, find a frame. 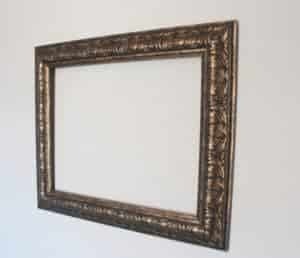 Most people have an old frame (or picture in storage) that they aren’t using. 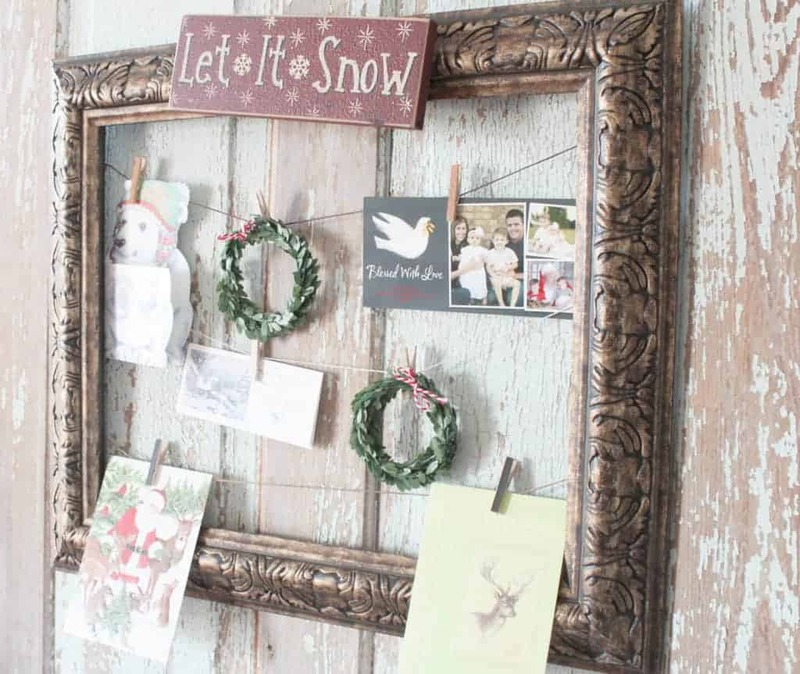 Anyone can create something simple like this DIY Christmas holiday card frame! 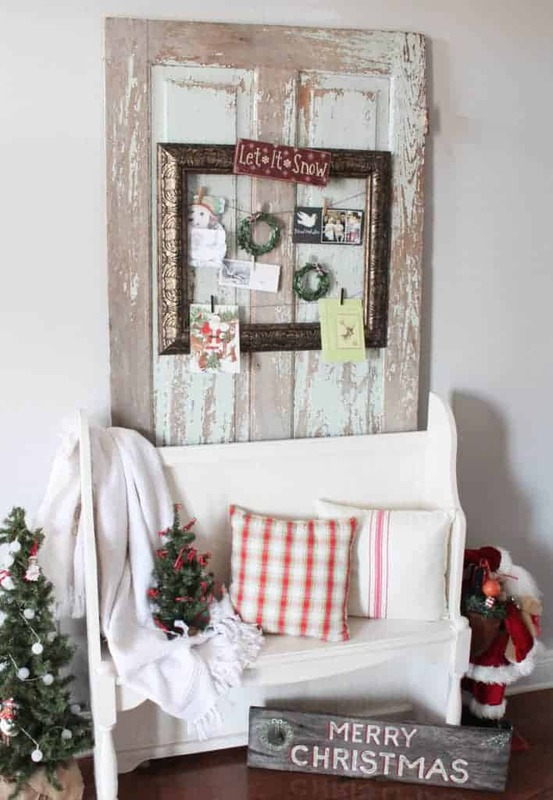 I’m off to find more ways organize, repurpose, and upcycle my clutter….errr Christmas Decor. And let’s not forget about the best part of this post- THE GIVEAWAY! Thanks for stopping by and I hope you’ve been inspired. 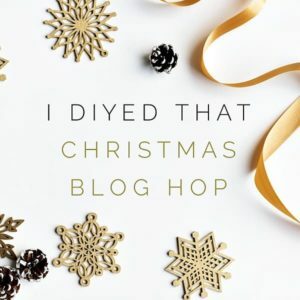 Please take a moment to visit these other bloggers and their amazing Christmas DIY’s! Next on the blog hop list is Tara, from the blog Pennies from Heaven. Lindsey – I love this idea so much! Those little wreaths are the cutest! thanks for being a part of this blog hop with me! This is such a great idea! Loved hopping with you! This is such a great idea, Lindsey! I may have to try this! This is such a good idea! 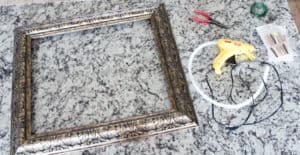 I have an old frame in my basement that I need to do this to! This is such a great project and can be used for every single holiday!! Love it, esp. 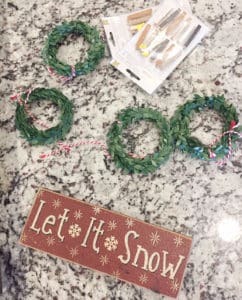 the mini wreaths. Very cute! Keeps the cards contained. Great idea. I need to make myself one of these! I was just thinking the other day I needed to get something to display our Christmas cards. My newly wed (read “poor as church mice”) kids did this, and were so pleased with the results! What a fabulous idea, love it! Such a simple but effective idea. Love it. Super cute idea! I think I may even have a spare frame around. This is such a great idea! I love that it looks easy to make, and it doesn’t take much to make it. I love the look of it! 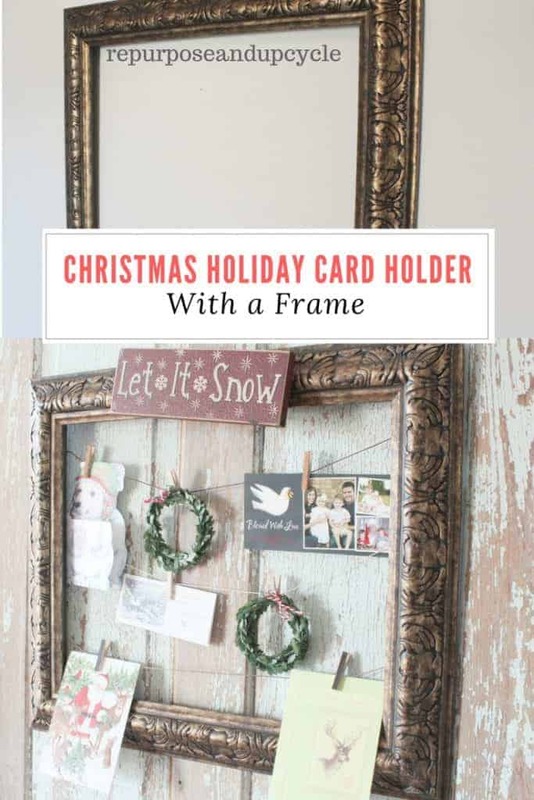 It’s a great way to hang Christmas cards! I love this project. Christmas cards are one of my favorite parts of Christmas. I know many people hate them, but i love keeping in touch with old friends and hearing the news about everyone’s life. I also love to display them. Hi Barbara, thanks for pinning. I’m glad you liked my holiday frame idea; so simple yet so functional! Have a great night. That’s a terrific idea! I just need to find me a frame now . . . Thanks for sharing at Party in Your PJs link party! Your card holder project is such a pretty idea, but your entire entry is gorgeous. I love everything about it. Thank you Leanna, you are too kind! Displaying cards is always a tricky one! You want them out but often have no space, this is very clever. Thanks for being a #bigpinklink-er this week! Oh how I love this ( and that frame!) . What a wonderful idea and featuring when my party opens up tonight. This is so nice! Thank you for sharing it with us at the Homestead Blog Hop! This is so lovely, may try this next year as our cards are just sat on the fireplace and it drives me mad every time they fall down!! Thanks so much for linking up at #KCACOLS. Hope you come back again next time. 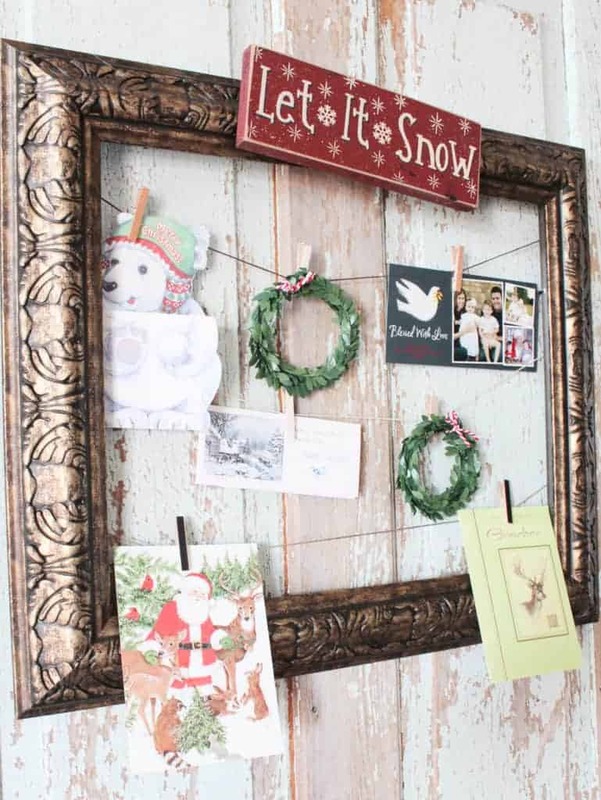 This is a fab way of displaying Christmas cards.